Flibco / ORN / Bohr Airport Shuttle 600 buses cheaply connect Frankfurt-Hahn Flughafen (HHN) and Mainz Hauptbahnhof via Ingelheim and Simmern (with easy onward connections to Wiesbaden by train or bus). Hahn Airport Shuttle 600 buses operated by Flibco / Bohr Omnibuses for ORN provide easy, fast, and cheap public transportation for travelers from Frankfurt-Hahn Airport (HHN) to Mainz (usually with stops in Simmern and Ingelheim) with easy connections to Wiesbaden and other nearby Rhine and Main River towns. These airport shuttle buses takes just over an hour from Frankfurt-Hahn Airport to Mainz Hauptbahnhof, which has excellent railway connections to other towns along the Rhine River including Wiesbaden, Bingen, Rüdesheim, Rüsselsheim, and Worms. Mainz is the closest IC or ICE train station to Hahn Airport but Frankfurt often have better connections. Taxis and private airport shuttles services from Frankfurt-Hahn Airport are relatively expensive and best reserved in advance – do compare prices before booking. Taxi2Airport and Suntransfers give online quotations for private airport transfers without first requiring personal details or flight numbers. The bus from Frankfurt-Hahn Airport to downtown Mainz (usually via Simmern and Ingelheim) has a confusing number of names. It is often referred to as the Airport Shuttle Hahn or Linie 600 Hahn Flughafen. The actual bus is operated by Flibco and Bohr Omnibus for ORN (Omnibusverkehr Rhein-Nahe) and any or all names may, or may not, appear on the bus or bus stops. The actual bus is most likely to be be green and white with flibco.com logos but could be white and red with ORN and / or Bohr, DB logos. Furthermore, it is part of the Rhein Nahe Bus network of Deutsche Bahn (but no Deutsche Bahn tickets or discounts are valid on the bus). There is only this one bus service between Flughafen Frankfurt-Hahn (HHN) and Mainz so any bus bearing Mainz should be the right one. However, many of the Flibco / Bohr buses on the Frankfurt-Hahn to Frankfurt am Main route stop in Mainz en route and these buses use a different stop at Hahn Airport. Most of the bus services to Mainz depart as bus line 600 for ORN from Terminal A stop 17 at Frankfurt-Hahn Airport. However, if the bus is operated by Flibco / Bohr with Frankfurt am Main as final destination, the bus will depart from Frankfurt-Hahn Airport terminal B stop 14. Hahn Airport is small – it is a short walk from terminal A to terminal B. In Mainz, Linie 600 buses stops at bus stop N across the road from ORN Kundencenter and directly in front of the Hauptbahnhof (train station). In Simmern, the Hahn airport bus stops at the Krankenhaus (hospital) stop in Holzbacher Straße. In Ingelheim, the Hahn airport bus stops at the Bahnhof (station) at stop 6 / F.
The Airport Shuttle Hahn buses take 70 minutes for the journey from Mainz Hauptbahnhof (Main / Central Train Station) to Flughafen Frankfurt-Hahn Airport. Wiesbaden Hauptbahnhof is only 11 minutes by S-Bahn train from Mainz main railway station, or use the local municipal bus from Mainz station to other destinations in Wiesbaden. Most, but not all, buses stop en route at Simmern (20 minutes) and Ingelheim (60 minutes). The stop at Ingelheim is directly at the station, which is useful for other destinations in the Rhine River valley and Saarbrücken. However, for long-distance trains Mainz is a better option. The Airport Shuttle Hahn bus schedule varies according to the season but generally 12 return journeys are available per day. Buses depart according to the timetable and do not wait for delayed flights. As the Airport Shuttle Hahn Bus is part of the ORN regional public transportation network, tickets are usually not discounted. 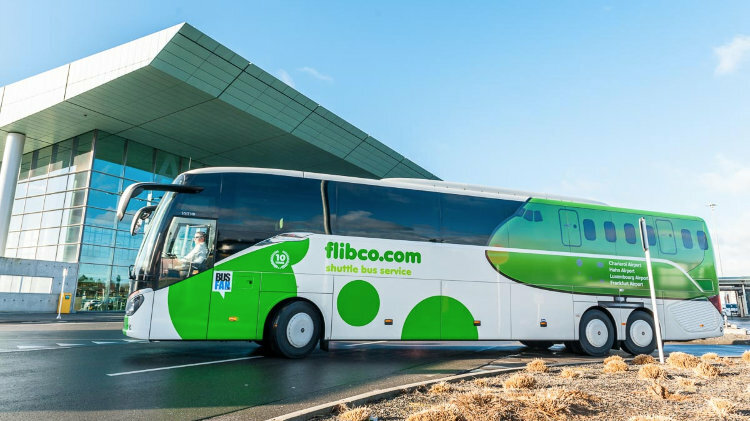 However, online reservations at Flibco is now available for all bus services and a good idea as it guarantees seat availability and for some services advance reservations may be as cheap as €5. Tickets bought on the bus are more expensive, only euro cash accepted. No Deutsche Bahn tickets or discount BahnCards are valid despite the DB Bahn on the bus schedules. Currently a one-way ticket for the shuttle bus from Hahn Airport to Mainz is €13.50 if bought online. Tickets from the driver are €15 to Ingelheim and €16 to Mainz. Due to complex legal reasons, tickets are not sold for the short stretch Hahn to Simmern but longer travel to Simmern from for example Mainz or Frankfurt Airport is allowed. Transportation to Frankfurt-Hahn has information on further shuttle bus services available from Flughafen Frankfurt-Hahn Airport to other German, Luxembourg, and French cities. Taxi2Airport and Suntransfers give online quotations for private airport transfers without first requiring personal details or flight numbers.